Bree Newsome and Maulian Dana will be in conversation with Rob Shetterly in Blue Hill at the Bay School’s Emlen Hall. 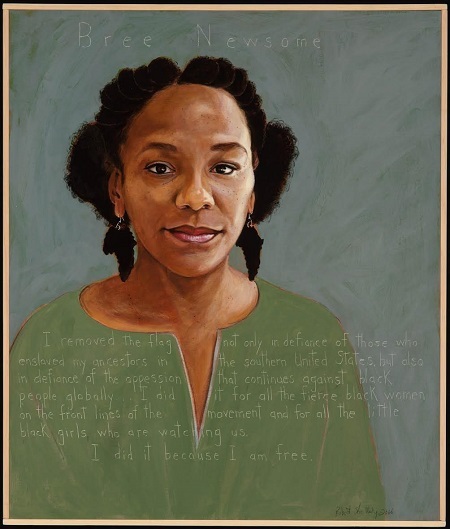 Bree Newsome is the young woman who, in the wake of the shooting of nine worshippers at Mother Emmanuel AME Church in Charleston, SC, climbed the flag pole at the SC State House and took down the confederate flag. Maulian Dana is the current Tribal Ambassador of the Penobscot Nation and a founding member of the Maine chapter of Not Your Mascot. This event is sponsored by Americans Who Tell the Truth and is supported by Reversing Falls Sanctuary and others.